The latest rumor is there will be a keyless Note 10. It looks good, but is it practical? I'm not very imaginative when it comes to tech. How would a case work? Gray Area and Jewels81 like this. Sounds brilliant, all done with gestures or pressure sensitive points. Cases simply won't need the cut-out areas for buttons and so would be more protective. My only concern atm is things like double press power button takes me straight to camera now on note 8 so I wonder how that would work on a button less note 10 and press all 3 buttons currently to re-boot/clear cache obviously won't be possible either. I'm sure I could live without the buttons tho. But capacitative pressure-sensitive "buttons" on the HTC U12+ were kind of a disaster. Hopefully Samsung learns from HTC's mistakes, if they are in fact going forward with this. Samsung is really pushing us along and I like it, although I'm just now starting to get used to gestures. I know others have had them for quite some time, but I haven't used anything other than a Note since 2013. I'm up for the challenge. I think the 10 will put the Note back where it was before they started beefing up the S series. Way more than an S with a pen! Yeah, at this stage is all speculation but interesting. I'm sure Sammy wouldn't make HTC's mistakes. I wouldn't be surprised to see headphone jack go from Note either....& that wouldn't bother me in the slightest. I have a sneaky feeling that the s-pen will have a lot more focus than the few little bits it got on the N9. If they get it REALLY right with cameras, bigger battery+faster charging they'll be nearly there with best 2019 device, 5G will be there but only because they have to do it, it really is an unnecessary cost at the moment but marketing will dictate it. I would really like to see the headphone jack moved up top with the IR blaster in it again, it's a small thing but lots of people really liked it, FM radio chip as well. Microphone in the s-pen would improve voice dictation in environments with background noise. 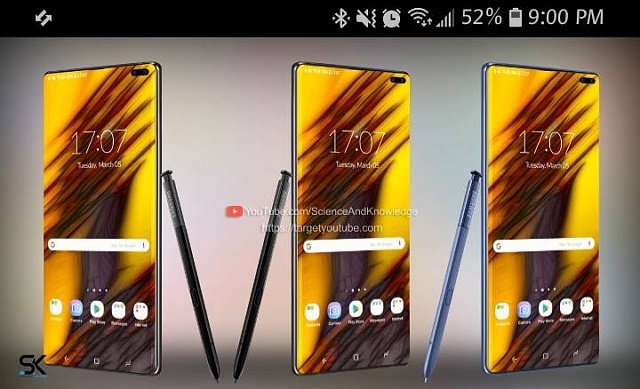 An external and optional but REALLY PRO s-pen must be on the drawing board as well, the way phablets and foldables are developing there is defo plenty of room for one and Samsung really do have the upper hand there. Yes, but being the more productive/workhorse oriented phone they could lose the camera & headphone jack & leave that for the S line...but they won't! Could be interesting first buttons then ports.. I highly doubt this will happen...it's too drastic. But if it does, I hope it's done properly. My question is how do you power it off and on with out a physical button? How do you reset the phone if it freezes? There is no pulling the Battery anymore. You'll need to go to Hogwarts and learn the Resetticus spell. There is no button to press. You can not shut off the phone or reboot from the home button anyway. I have a Note 9 now. The only way is with the power button. Do you have an S8 or s9? There is no "button". It's flat. But if you put a little pressure on it, it will activate the function/feature. For example on my s9 plus, if I touch the home area at the bottom-middle of the screen - that will bring me back to home. If I press and hold, it will activate Google assistant. The theory will the the same for the power and volume up/down gesture. Okay if your theory is correct then you will not be able to turn on the phone. When the phone is turned off the square is not there. So there will be no way to turn it on. So i do not think that is the right answer. I read another theory that might work. Sqeezing the sides like they do on the Pixel 3.